The so-called Matsui theory in post-cybernetics was presented as a new IE & OR frontier in 2008 and 2014. 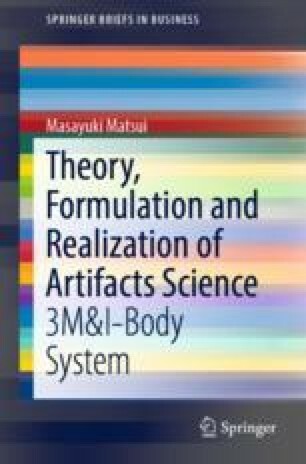 This interdisciplinary domain of artifacts science was also triggered and developed in Matsui’s (2016) book relating to the 3M&I-body system, which consists of human, material/machine, and money and information. This chapter reviews the new concept and domain of artifacts science. It also provides a white-box approach to the artifacts formulation included in Matsui’s matrix method, which consists of both the pair-matrix (PM) and matrix equation (ME). Matsui’s ME is a strategy story in which six logics are fitted to the Chinese ki-sho-ten-ketsu style. It is similar to the independent component analysis (ICA) in big data and the Riccati equation in control theory. Next, the third “transformation” stage (ten-) of Matsui’s ME is reconsidered. In addition, the rotation and sympathy (sharing) are characterized as types of the middle phase. Finally, Matsui’s ME can be embodied as the three-phase robot of artifacts body involving the waist (transformation), which is applicable to demand-to-supply enterprises such as convenience stores. That is, this chapter first develops the generality of sandwich (S = W) and its pair-map scheme in the 3M&I-body system. It then proposes the possibility of post-cybernetics, which was originally developed for demand-to-supply types in the field of enterprise instead of Wiener’s cybernetics. Here, we apply the post-cybernetics approach to a nature (physics) versus artifacts (economics) body. The hidden and interesting background to the pair-map (dynamics) is also explored; it is found in both the wave equation and duality chain. Our pair-map may be regarded as the problem of kernel in the S = W field.